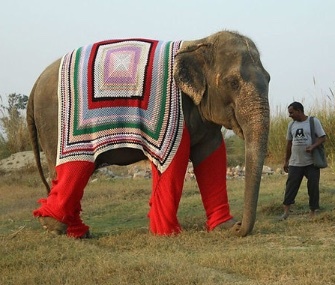 Elephants at a northern India sanctuary are staying warm with giant hand-knit sweaters. With extremely cold weather hitting their home in northern India, the 20 elephants who live at the Wildlife SOS are keeping warm with Jumbo Jackets knit by animal lovers in the area. The pachyderms who live at the center are blind, disabled or recovering from abuse, and their rescuers want to ensure they don’t have to endure any more discomfort.